Do you have this baseball card? You could be rich. Honus Wagner led the National League in batting average eight times during his storied career. A member of baseball’s first Hall of Fame class, most experts rate him as the greatest shortstop in the game’s history. Which still doesn’t fully explain why collectors sometimes pay more than $2 million for his 1909-11 T206 baseball card, more than they do for any other card. From 25 to about 200 of the cards still exist, Wiles writes, all the original products of the American Tobacco Company. ATC created a set of 500 cards, the biggest, grandest set of cards yet offered, in full color no less. Even so, Wagner, of the Pittsburgh Pirates, asked ATC to stop the presses.The myth, a popular one, especially for parents and for Little League coaches hoping to teach little Johnny a lesson, is that The Flying Dutchman so objected to tobacco in all forms that he nearly sprinted to ATC headquarters and demanded that workers quit printing his card be halted—immediately—lest he set a poor example for the kids. Well, as Wiles explains, the truest part of that last sentence is that it’s a myth. Wagner smoked cigars and chewed tobacco. We have pictures of him doing both. The other myth is that a penny-pinching Wagner wanted just compensation for his picture to appear on what was in effect an advertisement. That isn’t true, either, Wiles writes. Rather, it was cigarette smoking specifically that bothered Wagner. In those days, one could smoke a cigar or a pipe, and even chew, in polite company. Cigarette smoking, though, was just plain nasty to many folks. So, what was it about the Wagner card that made it so valuable? As mentioned, it is not the rarest of cards. And, while Wagner is an all-time great, he still lacks the name recognition of Ty Cobb or Babe Ruth. Wiles tells the story of a particular collector who put together a card catalog in 1937 and listed the Wagner card at a whopping $50. The price keeps going up.“The card is valuable because it is famous; it is famous because it is valuable,” noted Paul M. Green and Kit Kiefer in a baseball card book. Add: A Wagner card went for $2.1 million on April 6, 2013, following some rabid bidding. Another card, one considered in very good condition, sold for $1.2 million about a year before that in St. Louis. This article by Joe Holleman of the St. Louis Post-Dispatch gives a good rundown on some other baseball memorabilia that was purchased that day. Hockey great Wayne Gretzky and then-Los Angeles Kings Owner Bruce McNall teamed up in 1991 to buy a Wagner card for $451,000. This card is considered the top Wagner out there and has been sold several times since the Gretzky-McNall purchase. Ken Kendrick, owner of the Arizona Diamondbacks, bought it in 2011 for $2.8 million. In 2010, the School Sisters of Notre Dame in Baltimore sold a Wagner card in poor condition for $220,000, (Other web sites report different prices. ), or $70,000 more than the expected price. The brother of one of the School Sister nuns had donated the card. The order’s treasurer, Sister Virginia Mueller, did some research and soon discovered how much Wagner cards were worth. If you ever collected some change, headed to the store, bought a pack of baseball cards and unwrapped the wax paper with gleeful anticipation, then it may be time to pause for just a minute. Seymour Perry “Sy” Berger, inventor of the modern baseball card, died Sunday at the age of 91. Berger, along with co-worker Woodrow “Woody” Gelman designed the first Topps baseball card in the fall of 1951. Topps released its opening run of cards a few months later. That basic design—one with the player’s photo on the front and with his height, weight, stats and other trivia on the back—is still used by Topps today. Gelman, also the co-creator of Bazooka Joe, died in 1978. Berger worked for the Topps Co. for more than 50 years. Born July 12, 1923, on Manhattan’s Lower East Side, he served in the Army Air Forces during World War II and later graduated with an accounting degree from Bucknell University in Pennsylvania. At Bucknell, Berger befriended the son of a Topps executive. Founded in 1938, Topps’ roots go back to the American Leaf Tobacco Co., a business that Morris Shorin started in 1890. When American Leaf was cut off from its Turkish tobacco supply during World War I, and later during the Great Depression, Shorin’s four sons opted instead to sell chewing gum. The company also changed its name, hoping to be “tops” in the industry. The Shorin brothers needed a gimmick. They found a great one in 1950. Inside every gum package, they put a trading card featuring William Boyd, star of Hopalong Cassidy. Later, Topps added more movie and early T.V. stars. Finally, the company decided that bubble gum and baseball cards might go together. Berger and Gelman made their cards bigger than earlier baseball cards. They also added stat lines and a facsimile autograph. The kids couldn’t get enough. Topps had ordered an initial run of 310 different cards. Sales went so well that the company added another series of 97. It was the largest set of baseball cards anyone had put out in decades. Topps sold its cards stacked neatly on top of one another, wrapped in wax paper and always with a stick of pink gum, tougher than leather. Later, the company also packaged cards in something called “rack packs,” basically three packed wrapped together, each in clear package. The advantage? You knew at least six of the cards and could rummage through the assortment, looking for the best combo. Topps tipped you off on who the good players were, even if you didn’t know much about baseball. If the number on the back ended in a “5” or a “0,”that was a guy who could play. If the number ended in a “00,” well, that was a superstar. So, sure, you selected a pack, put your change onto the counter, and you hoped to get one of the best players from your favorite team. But, if you got No. 300, that was pretty good, too. Collectors, from grandsons to grandpas, couldn’t get enough rookie cards for a while. They hoarded every first-year Alex Rodriguez or Don Mattingly they could find. The prices went up and up. Really, the baseball card industry went nuts for a time. Buy low and sell high, high, high. That was the plan. Guys who had old, mint sets from the 1950s cashed in. Then, it crashed. A Ken Reitz baseball card, mint or not, was worth only so much. Some cards still sell for astronomical numbers. Most are pre-Topps cards. 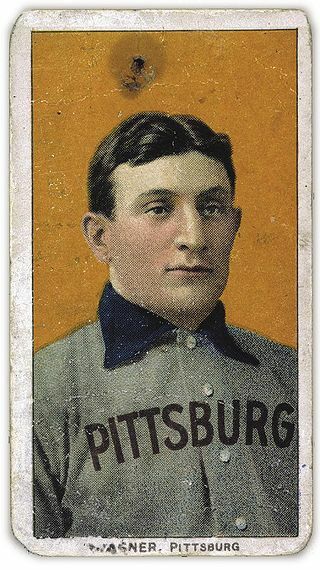 The T206 Honus Wagner card, issued by the American Tobacco Company from 1909 to 1911, is the Mona Lisa of painted cardboard. Fewer than 60 of the cards exist. A near-mint version sold for 2.8 million in 2007. The School Sisters of Notre Dame in Baltimore sold a T206 in poor condition for $262,000 in 2010. The top Topps card is the 1952 Mickey Mantle. In mint condition, it sells for more than $10,000. During the Mantle era, the Mick’s card usually fetches the most money in that year’s set. Sy Berger lived to see baseball card collecting become a popular pastime for the young and old, much like the game of baseball itself. The hobby is different today, less innocent, just like a lot of things. But the eager collector still hopes to unwrap a pack of cards and find a picture of his favorite player. Only a piece of cardboard? Sure, but even a piece of cardboard can put a gleam in your eye.